Latvian middle classes – do they exist? Celebrity – Moi, Non non non !!! Sorry about the title being in French, but had to be ready for my French students tomorrow. Just trying to get in to the mood. This was the chant that might have caused a sore throat, but thankfully it didn’t. 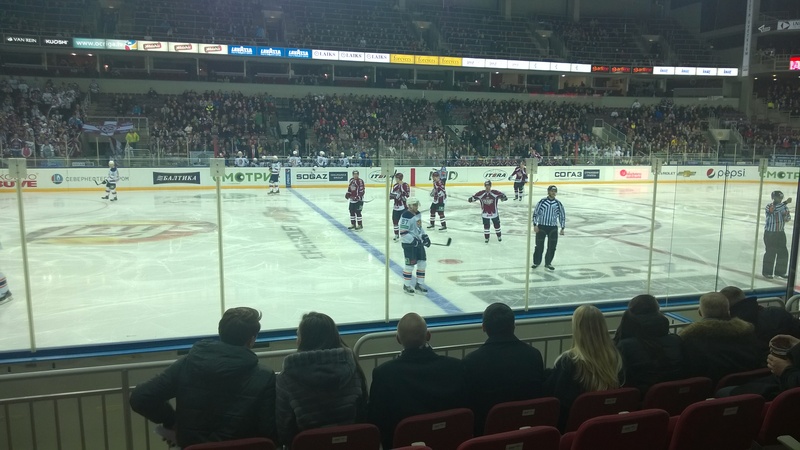 On Friday I attended my first ever ice hockey match, and I’m so glad I went. Apart from Dynamo Riga winning 3 – 1 it was just so much fun. Unlike feeling inhibited at football/soccer matches in case you upset someone’s sensitivities and cause a fight. At the Riga Arena I felt able to chant and heckle without feeling that security was going to evict me. I can’t comment on the skill levels on display but the match was fast, furious, frenetic, no prima donnas on display and definitely no arguments with the referee, a great spectacle for all to take the family. Another plus is that for fantastic seats the tickets are great value. Just a shame the arena was only half full. Come on you Rigans (Ridzinieks) get down to the Arena and support your team, they need you. We were recently lucky to be invited to the Independence Day celebrations at our local village school. For my non Latvian readers that is independence from Soviet occupation not aliens. A hugely important day, one in which Latvians celebrate their freedom, culture and what it means to be Latvian. On a bitterly cold evening we arrived at what we thought was an early time, only to find all the seats taken. I suspect people were saving money on heating their homes and keeping warm at the school. The celebrations began with a concert of traditional music, song and dance. All age groups of the village were involved and it was a surprisingly professional production from a small community with an estimated population of less than 400. One thing Latvians do really well is celebrate and acknowledge individuals contributions to their communities. During an interval in the concert speeches were given by local dignitaries and certificates awarded to individuals who have made a significant contribution to the community. After each award members of the audience queued to give flowers to the recipients. A lovely gesture but I did feel slightly uncomfortable when a couple of award winners only received 3 or 4 bunches of flowers when most of others had long queues. These local heroes are often overlooked in the UK, perhaps one of my UK readers can instigate this back in my homeland. Thank god for some bad weather. Over the past two months all I seem to have done is move piles of something. It has either been spreading piles of cow crap around the fruit bushes and trees, moving a large pile of sand to create a level base for our extension, moving piles of logs into the barn to keep dry or more recently raking and moving piles of leaves off our one hectare garden. My whole body aches and I have resorted to having a twice weekly massage to sort out some muscular problems. This list is a comparison with the UK. So please don’t have a go at me if you have lots in your country of residence. The list is in no particular order, just as they enter my mind. STORKS – You see them everywhere, even at the fringes of Riga. Driving to work this morning I noticed all the storks had gone, and the countryside could have been anywhere. It’s the storks that define the Latvian countryside. VERY ATTRACTIVE WOMEN – For a small country Latvia has more than it’s fair share of beautiful women. The only problem is I keep getting in trouble when I look. I try to remind Inta of something my mum used to say, “I’ll start to worry when your dad steps looking.” The implication being that dad would have a mistress. I don’t think Inta buys this explanation. SAD BUILDINGS – Riga has lots of lovely interesting buildings that desperately need renovating. It’s not that they are unloved, it’s just down to the economics of a fledgling democracy. CAKES – It’s a bit like being in France. Every supermarket has a huge range of probably very fattening but delicious cakes. As Latvians start to lead a more westernised existence, perhaps health problems could be on the way. LAKES AND FORESTS – I don’t know the exact figure but I suspect half Latvia’s land mass must be Lakes or forests. So if you are travelling have your costume and towel on standby and a nice wicker basket so you can go foraging. CYCLISTS ON PAVEMENTS/SIDEWALKS – This is a pet hate of mine. Pavements are for pedestrians not for any other form of transport. Mixing cyclist and pedestrians is just a disaster waiting to happen. FLOWER SELLERS – I deliberately haven’t called them florists because they just sell flowers. In the centre of Riga there is a row of them who seen to be open from dawn to late night. Inta said they used to be open 24/7, don’t know if they still are. The giving of flowers is a major part of Latvian culture. I was privileged to be invited to a Latvian students graduation. I have never seen so many flowers at one time. Every student, male and female, had arms full of them. LADAS – Yes you will still see quite a few around Riga, some renovated and some falling apart. COBBLED ROADS – They may look very pretty, but I hate to think what they are doing to my car suspension. BEACHES – The whole of the Latvia coastline is a beach. NON-ASPHALT ROADS – Lots of these in the countryside so be prepared to wash your car regularly. I’d be interested to hear from Latvians about additions to the list. The house is like a building site. Now I know much has been said about the poor condition of Latvian roads, but the road between Limbazi and Steine must be the worst. There is a section of it, approximately 7 kilometres, which ranks as the worst I have driven on any where in Latvia. This is not a really remote place. The roads in the rural areas around Dagda are like driving on glass compared to this. I have a six km drive on these roads every time I need to go to Limbazi and I have a headache by the time I get there. I can’t believe there are any worse than this, is there? After a days rest, we headed off in to the countryside in search of an authentic celebration. In response an earlier blog somebody recommended that we go to a farm called Gulbi which is about 2.5 hrs from Riga in the general direction of Daugavpils, in the Latgale region. Now I say 2.5hrs but if you have to stop to pick up flowers it takes 4hrs. Now 9 is a magic number and Inta was told we had to pick 27 different types of flowers: One bunch of 9 for yourself, one for your loved ones and one for your country. I daren’t look at the condition of my tyres after lots of sudden steps. To give you an idea how remote this farm is, the last 40 km were on gravel roads not asphalt. We finally arrived at about 2.00 pm to be greeted by Rita the lady of the house, whose burning passion is to convince people to move back in to the countryside. We were informed that due to the bad weather numbers were going to be down on previous years; in fact there was just going to be Inta and I and her extended family. I didn’t realise the implications of this until later in the evening. One of our first steps was to visit the kitchen where Rita was eager for us to taste her version of balsam. Made with about 30 different types of herbs and flowers and surgical spirits, is was loti garsigs (very tasty) and very warming. The first activity was to collect flowers from the flower meadows so the ladies could make crowns with them. Whilst this was happening we were followed around the fields being retailed by a accordionist and his singing partner. I had to collect some flowers of my own, didn’t know why. Just told to collect some and all would be revealed later. Now I’m not sure why any of this was happening so any help would be appreciated. Over the next couple of hours we did some eating and drinking and it was now I realised the significance of being the only non family members at the event. Everytime a family member went round pouring shots of the homemade stuff, I was always offered a shot. Now not wanting to upset local sensitivities I obviously accepted. However I started to realise that unless I could figure out a way to say, I’d had enough, I wasn’t going to make it through the night. This is where Inta stepped in and explained I was a lightweight when it comes to spirit consumption and I wasn’t asked any more. I’m sure there were a few more sniggers behind my back though. Well after dancing round a couple of bonfires, dancing with a witch,. Trying to recite some Latvian poetry and eating and drinking a little more we finally headed to bed about 2:30 am. Didn’t make it until sunrise unfortunately. No bed just happened to be the back of my Vauxhall Vectra Estate. It didn’t matter though because I was too exhausted to worry about comfort. I fell to sleep trying to forget that I was now a lightweight when it cam to alcohol consumption and all night partying. Check out the pictures I took by clicking here. Decided to spend mid summer solstice immersing my self in some Latvian cultural entertainment. Again, as at all Latvian events, lots and food, beer, singing and dancing. Now before anyone takes offence I’m actually paying some compliments here. Despite copious amounts of alcohol being consumed there was a wonderful atmosphere in Mezaparka on Saturday, This is in stark contrast to when a load Englishmen get together and have a few drinks. I believe the Freedom Monument in Riga has been the subject of visits by intoxicated Englishmen on stag party weekends, so I think my Latvian readers. Will know what I’m talking about. The main attraction didn’t start until 10.00pm yet people had been arriving from mid-day. Not sure what state they were in when the main entertainment started. The Latvians organisers really do know how to put on a spectacle, and considering the performers came from all corners of Latvia what they managed to achieve was nothing short of miraculous. It was basically a night of song and dance telling the story of Jani and Liga with a few witches thrown in for good luck. I’m not sure if it was intended by the producers but there was a lot of sexual imagery taking place. Straight from the start your have a very attractive young girl dancing around the haystacks. After a minute or so a handsome young man appears riding a huge stallion. Now if there isn’t sexual innuendo there, then I’ll eat my hat. You only have to look at the photographs I took and you will see what I mean. Anyway it was a great spectacle and congratulations to everyone involved.